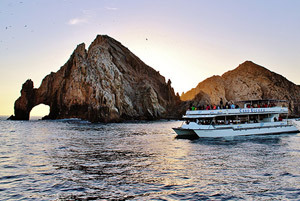 Please send me more information on Cabo Escape Tours! Get close to nature on our twin level power catamaran. 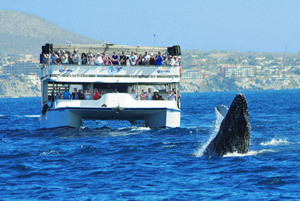 Learn about the whales as you watch them jump, play and float near the boat. Enjoy breakfast including an open bar with mimosas! There is plenty of space for families and fun for all. Tour runs from December 15 - April 14. Tour Includes: Professional whale guide, complete breakfast including fruit salad, coffee and juice, mimosas, Bloody Mary's, music and games with the MC/Guide and guaranteed amazing views of the whales. Check-In: Meet at Dock 0 (zero) on the Cabo marina behind Hacienda Beach Resort 45 minutes prior to your tour. Start your day off right! Snorkeling, breakfast, drinks and fun. Visit the world-famous arch and then cruise the Pacific coast while seeing Land's End at the best time. After watching for sea life, jump in the ocean. You will get plenty of time with the tropical fish in one of the best snorkel spots in Baja. Enjoy reggae, Latin and light dance music, fun and games with the MC until the boat docks. Tour runs from April 15 - December 14. Tour Includes: Grilled lunch, cruise, snorkel activities, protected areas permit, open bar, music and games with the MC/Guide. 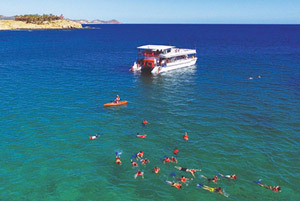 Visit the arch of Cabo San Lucas then head to the best snorkeling beach in Cabo aboard our twin level power catamaran. Watch sea life and enjoy fun and games. Gear is provided, so jump on in and enjoy the tropical fish. Or just play and float near the boat. As the boat heads back, there will be a delicious meal and an open bar. Perfect for those looking to have a great time! Tour Includes: Lunch, open bar, cruise, snorkel at Chileno Beach, reggae and light pop music, games with the MC. Please Bring: Towels, sunscreen, camera and cash for souvenirs. Listen to fun music, have some delicious food and tasty drinks while visiting the arch and viewing the incredible beaches of the Pacific. As the bartender serves up some more drinks from the open bar, participate in games, get your groove on, and dance under the stars of Baja. Tour Includes: Salsa bar (salsa, chips, guacamole and veggie dip), open bar, fajita dinner buffet, Latin and popular music and games with the MC. Check-In: Meet at Dock 0 (zero)on the Cabo marina behind Hacienda Beach Resort 45 minutes prior to your tour. Please Bring: Camera, light jacket and cash for souvenirs. Pack your dancing shoes and get ready to groove! Prepare for Cabo’s only floating club. After you board the 70 foot two-story catamaran, you will party under the stars with the best views of Cabo. Excellent DJ/MC, VIP tables, Star Lounge, two bars and full table service. You can choose open bar service or select your favorite bottle. There is lots of space to dance, watch the action or just be seen!